VPTPCM-12 Line Conditioning Module | VPT, Inc. When your input power is on the line, depend on VPT’s line conditioning module. The VPTPCM-12 ensures smooth, consistent input power for the ultimate flexibility in designing reliable military and avionics system operation. 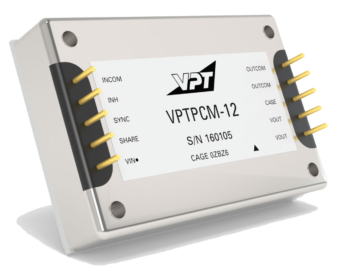 The VPTPCM-12 works with VPT’s DV and VPT Series DC-DC converters. Electrical performance data provided below is at Tcase = -55° C to 100° C, Vin= +28V +-5%, full load, unless otherwise specified.